Milkshakes have become more of a routine for me after my kiddo as it is a quick,healthy and filling snack option.Also, my kiddo is not fond of drinking milk and I find that the milkshake is a great way to include milk in his diet and keeps him full until his dinner. I usually prepare fruit milkshakes like Mango Milkshake, Strawberry Milkshake, Avocado Milkshake, Banana Milkshake, Chikoo Milkshake and also Oreo Cookies Milkshake and Dates Milkshake quite often. 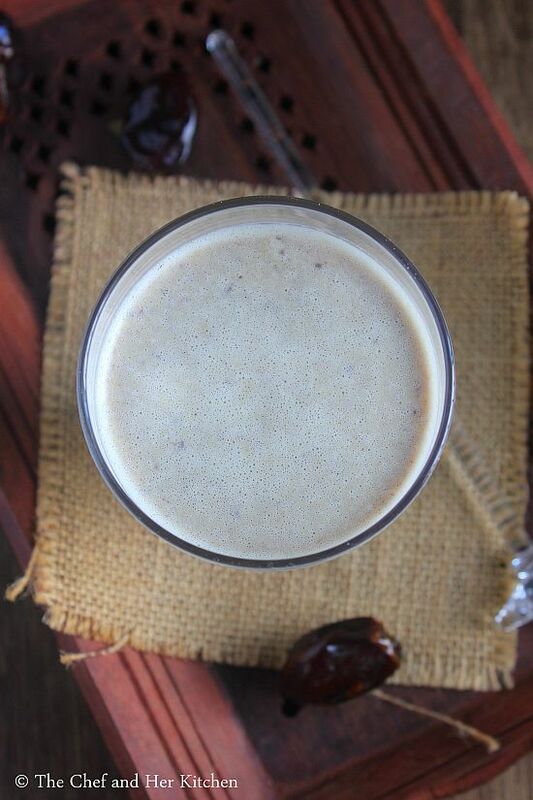 I try to replace sugar with mostly dates in few shakes like Banana Milkshake, Chikoo Milkshake but in the rest I use the regular sugar.Also, I use full cream milk for him and also add cream at times which is collected from the boiled milk to make it rich which acts as a perfect energy booster for him. I usually make a big batch of mixed dry fruit powder made out of roasted Almonds, Walnuts and Cashew nuts and I add it to all the milkshakes, kheers and halwas which I prepare for my kiddo. If you do not have dry fruit powder, you can skip it totally or you can even add a couple of almonds and cashew nuts while soaking the dates. 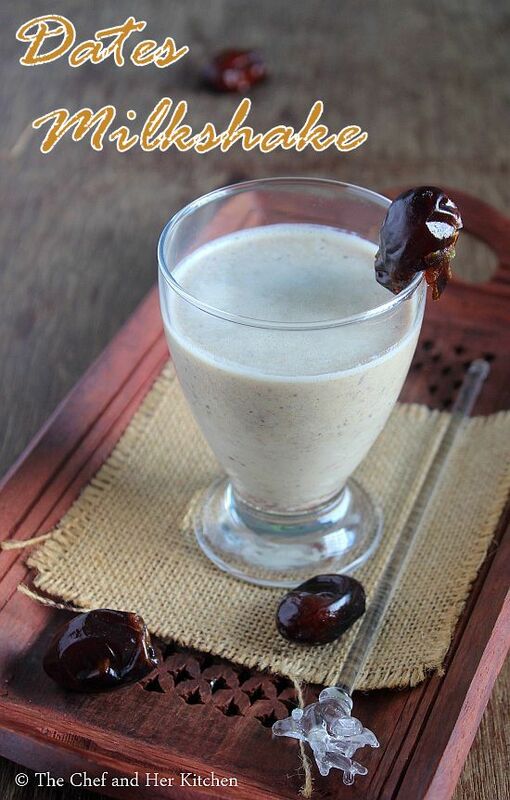 I like to add dry fruits to the milkshakes and halwas as it adds nice taste, texture and also all the goodness from the nuts enhances it to the new level.As I prepare these milkshakes mostly for my kiddo, I avoid ice cream in them but one can add it as it adds the creaminess to the milkshake.Also as we are using more dates in the milkshake it does not need extra sweetener but one can add it according to their taste buds. 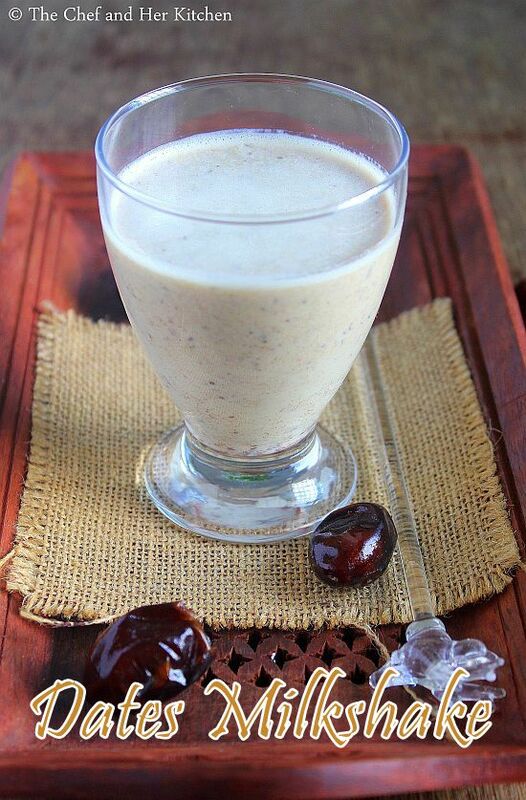 Warm 1/2 cup of milk and soak the soft pitted dates in milk for half an hour. 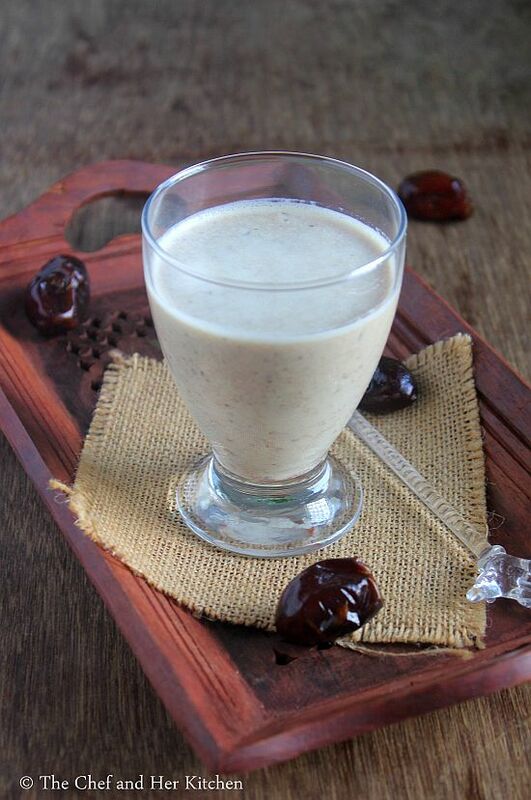 Blend the dates with the remaining milk along with dry fruit powder and a scoop of vanilla ice cream (if using) nicley using a hand blender or you can even do it in mixie.You can taste it and add sugar if required and blend it again. Serve it with vanilla ice cream on top and drizzle with date syrup. In case you do not have dry fruit powder you can skip it or you can soak few almonds and cashew nuts along with dates in the milk. The addition of ice cream is optional but gives a creamy texture to it. I do not use it for my kid and hence I did nod add it.